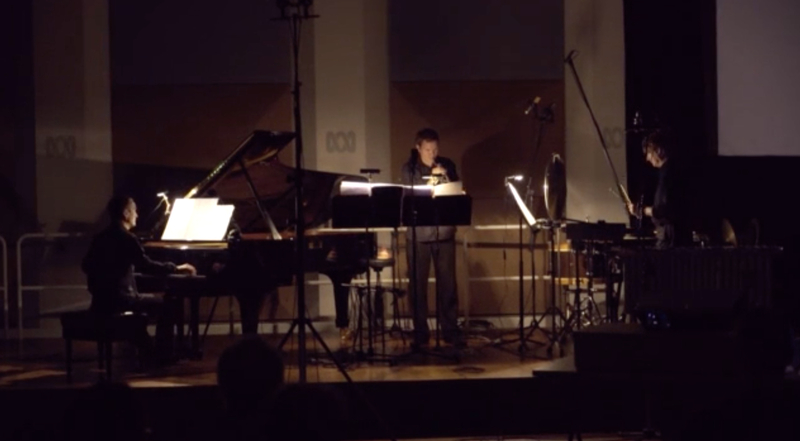 Bruce Crossman, Dying of the Light: Pacific Resonance for Peter (soprano saxophone) for Katia Beaugeais for performance (rescheduled) at the 17th World Saxophone Congress 2015, Strasbourg, France in July 2015 and her doctoral research on the dual role of a composer-performer and an Australian Music Centre Composer Resource Kit. Bruce Crossman, Where are the Sounds of Joy? 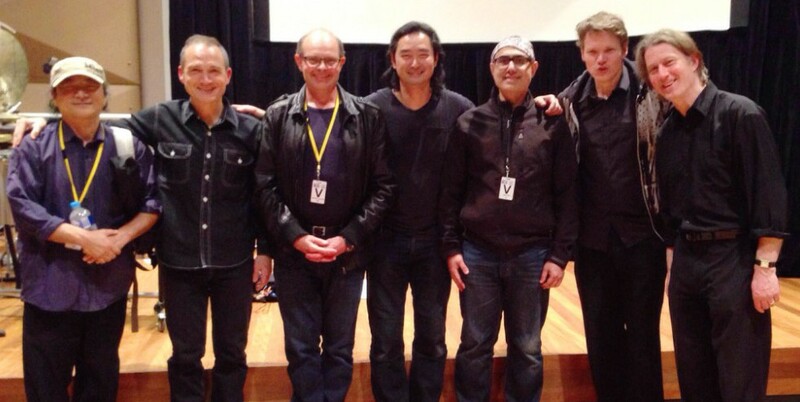 for Tristram Williams (trumpet), Peter Neville (percussion) and Michael Kieran Harvey (piano) at the Melbourne Composers League-ABC Classic FM ‘Where are the Sounds of Joy’ concert, Iwaki Auditorium on 26 September 2015. The performance will feature a short film by Iqbal Barkat and Vincent Tay (Filigree Films) with images by Luping Zeng (artist, see below image). 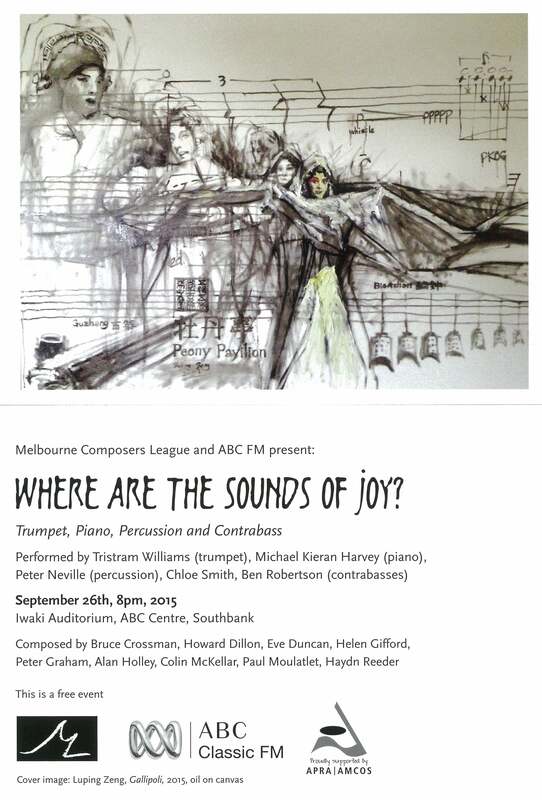 Evenings with Martin Buzacott: Friday 6 November 2015, 10:00pm | Melbourne Composers’ League: Where are the Sounds of Joy? Bruce Crossman, collaborator residency at Aichi University of the Arts, Nagakute, Aichi Prefecture, Japan, 14-18 December 2015. It will include writing a commissioned work for solo harp, mentoring composers, as well as presenting public lectures on Australian approaches to compositional creativity. The residency will focus on sharing musical aesthetics with Akira Kobayashi. Yukiko Hirao, Akira Kobayashi, Bruce Crossman and Tomoyuki Hisatome—relaxing and discussing traditional Japanese music influences in composition at a Sushi bar in Nagoya and the rehearsal at Aichi University of the Arts, in Nagoya. Lecture: Bruce Crossman: “Creativity and the Swamp Monster: Artistry, Reiterative Cycle and Creative Voice” presentation at Nagoya University, Japan on 15 December 2015. 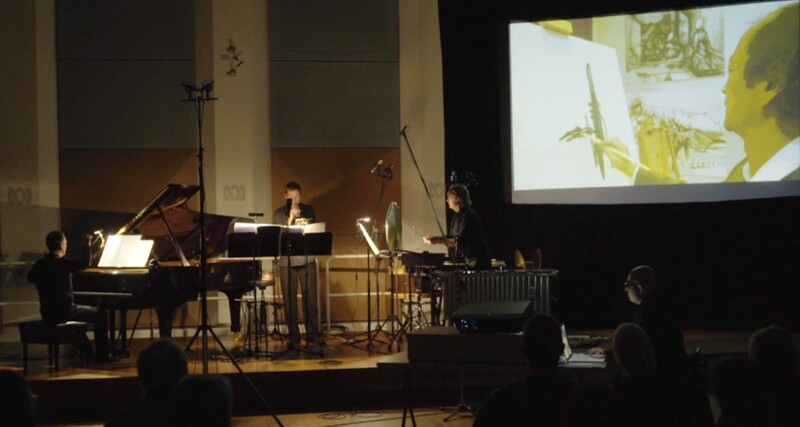 Concert: Bruce Crossman, Emergence from Darkness (harp, Yukiko Hirao), at East Meets West in Chamber Music Hall, Aichi University of the Arts, Japan on 17 December 2015. The Collaborator, Aichi University of the Arts project is supported by the Commonwealth through the Australia-Japan Foundation, which is part of the Department of Foreign Affairs and Trade. Bruce Crossman and Australian Federal MP, Fiona Scott, at Western Sydney University celebrate the Australia-Japan Foundation grant.